Purple Mountain has been calling to me, beckoning that I climb to its top before the end of the season. And several nights ago, I undertook answering its summon. The light emanating from the nearly full, blue moon was dimmed by the thin cloud cover, but I could still see well enough to forgo headlight use. The world was black and white; no other colors existed. The climb seemed endless, but even as I slogged on and my skis bogged down in stashes of powder, I was enjoying every minute. 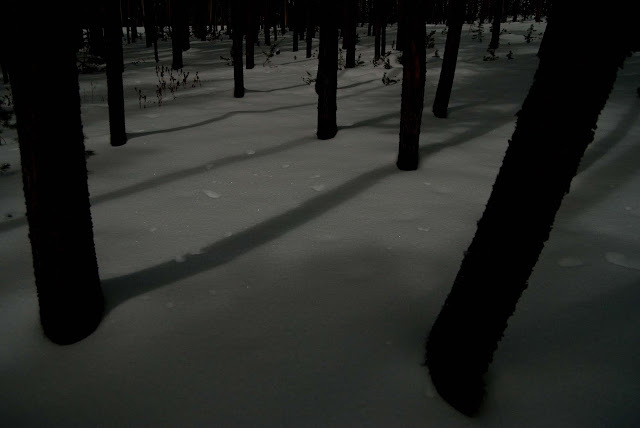 I had already passed several wolf tracks cutting across the trail, causing much suspicion and eyeing of black blobs in the trees, but I soon relaxed my fears, something I am learning to do pretty effectively. The summit was imminent; I could tell by the tree-top horizon line above me and the deepening of the snow. Forcing my skis through deep drifts and wandering about in deep thoughts, I kicked hard at my skis to release them from the crusty and powdery snow, when suddenly…a flash in my peripheral. 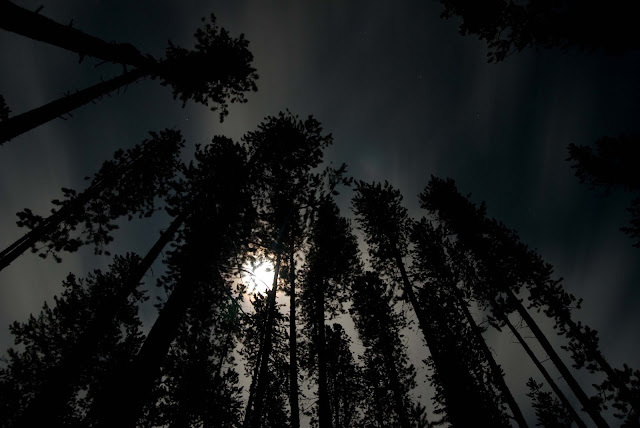 A small object had jetted through the air from behind me, and landed in the lodgepole pine tree in front of me to my left. I immediately thought “owl!” This was terribly exciting. Without taking my eyes off the tree, I fumbled for my headlamp and then fumbled for the on switch. I pointed the pale blue light of my headlamp at the owl sitting on a branch. The stick-like owl remained the stick that it was. I scanned the tree more thoroughly, and was pleased to find a furry tail hanging from the bark. The tail belonged to none other than the flying squirrel. It clung frozen to the tree, eyeing me suspiciously. I stood frozen, eyeing it curiously. At that very moment, I decided that the flying squirrel is my favorite mammal. With a small step closer, I frightened it further up the tree. Another step closer and it made a mighty leap from the tree. I could see its pure white underbelly as it flared its “wings” out. Kamikaze-like, the flying squirrel careened through the air; moments later I heard it smack into another tree, out of sight. Two or three times that night, I perceived that the squirrel was following me, but was never able to see it again. I have had one other similar experience with a flying squirrel while mountain biking at night in the Bozeman area. Nearly the same thing happened; I had stopped after hearing my buddy Jon eat it on an invisible stump behind me. Just as I turned my head around to see the damage done to Jon, a flying squirrel banked right in front of me and landed on a tree next to me. I now believe that these squirrels, out of pure curiosity, will purposefully fly and land next to you just to check you out. (By the way, Jon wrecked pretty good, but was ok as I surmised from his smile; even though it is deadly, we love night mountain biking). I made it to the top of Purple Mountain, and then made some sloppy but great tele turns down the slope on my cross country skis, only getting a face full of snow every few meters. How many flying squirrels leapt into the air after me on my descent? To my readers: Has anyone else had a flying squirrel experience? I would love to hear (jessedevoe@gmail.com)! Jesse, I hope someone else will soon chime in. I've never seen a flying squirrel in the wild, let alone had an 'experience'. So are they nocturnal? What an interesting experience you gave them--they must not see many night-gliding biologists either. How fun that they were also curious about you. I'm really enjoying your writing. These two moonlight photos are beautiful. When I was a kid, way back in the 60s, a friend of mine had a flying squirrel as a pet. I know, can't do that now, but it was another place & time. It would glide from one person's shoulder to another for peanutbutter treats. The squirrels are common here in Connecticut, but many people don't get to observe them because they are nocturnal. One took over a birdhouse out in our yard one year & your cousin, Nathaniel, was quite surprised when he reached in to feel what was inside and woke the poor little creature from its slumber. The flying squirrel popped its head out, chattered at Nate, and then went back to sleep..must've had a busy night. Flying squirrels? I have never seen one. Better than flying bears I suppose. Your narrative conjours up many imaginative thoughts about a very magical night. Years ago we used to have them living in the west wall of the house. They got in through a woodpecker hole. We were worried about them chewing through the drywall or wiring so finally evicted them and put up a nest box over their hole. They did not take to the nextbox, unfortunately but there were a lot of other options near by.